Galactic cluster with active elliptical NGC 6051 at its center. White indicates visible light, blue indicates X-ray emission, and red indicates radio synchrotron emission. Courtesy of NASA, Chandra, SDSS, and GMRT. 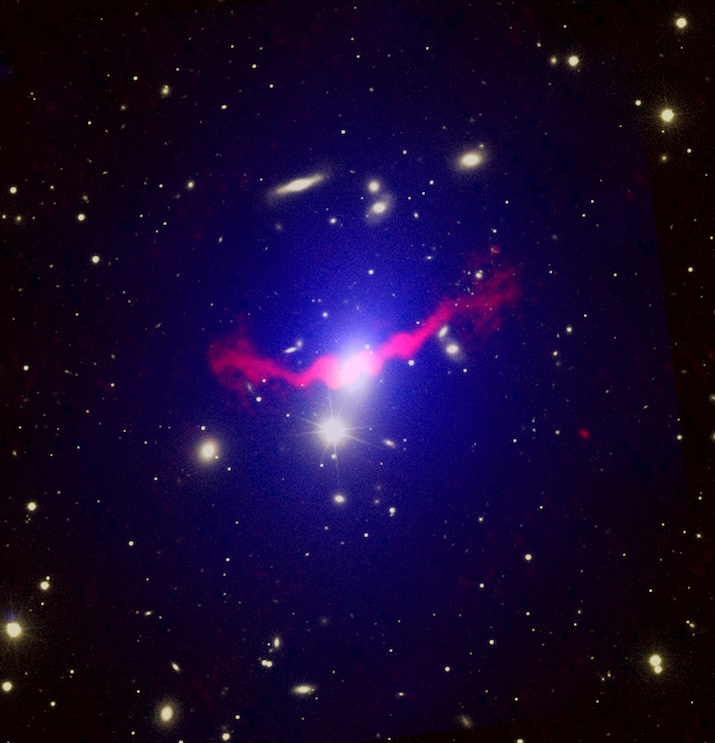 This Chandra X-ray study has concluded that many galactic clusters include a central giant elliptical galaxy that ejects huge quantities of both matter and energy into the intracluster region (see above image). In fact, the estimate exceeds a million solar masses of iron atoms and energy output equivalent to the entire Milky Way galaxy luminosity over a million years. The conclusion is that somehow the supermassive black holes at the center of these clusters commonly produce these effects. Doesn’t this push the accretion mechanism as an explanation of these observations further out on the already shaky limb? It seems that the combination of prodigious energy production over a sustained timeframe, together with considerable matter ejection over similar timeframes, constrains likely explanations to an evermore narrow range, with SQK cosmology near the center of that range. In regard to the above posting by gmagee, yes I agree, the findings regarding the giant elliptical galaxy NGC 6051 definitely contradict the notion that galactic cores are accreting matter from their surroundings. This study shows just the opposite that active galactic cores energetically eject material in prodigious amounts. The radio jets (pink areas in the above image) indicate that the core of this galaxy is active. Iron atoms are easily detectable at x-ray wavelengths which is why no comment was made on the intercluster gas density of ejected hydrogen and helium. In the solar system the hydrogen and helium mass abundance is 1,000 times greater than the iron mass abundance. So if the same ratio applies to the ejections coming out of this galaxy, we could expect that this galaxy has ejected a total of a billion solar masses of matter, equal to the mass of a dwarf elliptical galaxy. Comments Off on Smallest Particles not Objects? 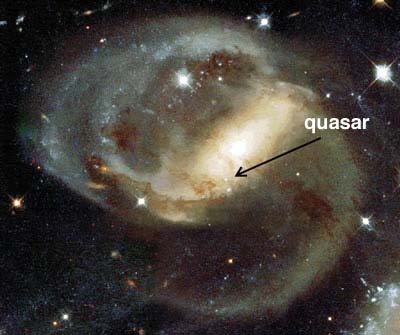 In retrospect considering SQK theory, it seems self-evident that the smallest (least massive, least charged) detectable particle in our universe cannot be a solid object. Is it not logical that such an object must be linked somehow to even smaller objects which provide means to project a field or force that interacts with larger, more influential particles of our universe? And thus, such an object cannot be the smallest which interacts with our universe. Obviously, etherons fit the model of the even smaller objects. Do conventional theories account for this idea? (Upon presenting this concept to a nuclear physicist friend, my question is quickly discounted with a simple gesture.) Can SQK shed further light on this simplistic notion? Primordial Lithium-7 Discrepancy for SQK? Comments Off on Primordial Lithium-7 Discrepancy for SQK? According to an article in the February 2011 edition of Astronomy magazine, the relatively constant measure of lithium-7 in galactic halo stars has been interpreted as evidence for Big Bang Nucleosynthesis of this element, rather than from a stellar process. However, the measured Li-7, in both these halo stars and in stars of the globular cluster NGC 6397, is far less abundant that Big Bang Nucleosynthesis predicts. The conclusion is that some stellar process must destroy the primordial Li-7. Is this further evidence against Big Bang theory? And what insight from this observation can be gained from SQK? For many years, the big bang theory has been seriously challenged in regard to its prediction for the cosmic abundance of lithium. Big bang nucleosynthesis predicts lithium-7 levels that are three times higher than are observed in the atmospheres of old stars. To rescue their theory, some big bang theorists have attempted to hypothesize that lithium-7 is somehow transported from the surface of the star into its interior where it is hidden from view. Others have speculated that post BB processes have depleted lithium-7 from its former primordial value. Lithium-6 presents another problem. In this case the big bang nucleosynthesis theory predicts negligible amounts of lithium-6 where observations have shown Li-6 to be present at detectable levels that are an order of magnitude less abundant than Li-7. The simple answer is that there was no big bang. This leaves lithium abundances to be explained entirely in terms of stellar nucleosynthesis or through parthenogenic elemental transmutation, which is consistent with the subquantum kinetics cosmology.